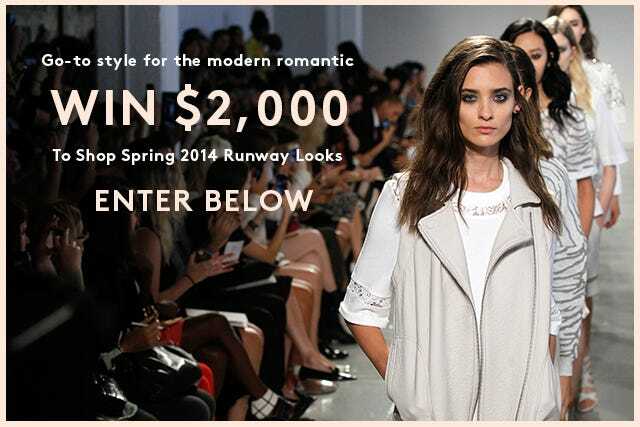 Win $2,000 Of Chic Spring Clothes From Rebecca Taylor! As this never-ending winter rages on, we’re over our woolens and daydreaming about fresh spring styles. Rebecca Taylor, always one of our Fashion Week favorites, absolutely nailed the modern romantic look that’s going to be everywhere this season. The bright, sporty, yet undeniably feminine spring 2014 collection features cool neutrals, playful proportions, and fun fabrics from athletic mesh to ladylike lace. But, before you blow your savings on must-have crop tops and flirty frocks, take a deep breath. We’re giving away a sweet $2,000 to shop the Rebecca Taylor spring collection, hitting stores soon. All you have to do? Simply enter your email address in the box below. The only question remaining is how you’re going to spend that $2K. For our money, we’d grab a '90s-inspired bomber jacket, perforated leather dress, some chunky cropped sweaters, and a crisp pair of tailored trousers — all the perfect pieces for a slick spring wardrobe. Go ahead, enter your info, and hit submit in the box below before time runs out. Here's to many chic and sunny days ahead! NO PURCHASE NECESSARY TO ENTER OR WIN THIS SWEEPSTAKES. THE "REFINERY29 x REBECCA TAYLOR" SWEEPSTAKES IS OPEN TO LEGAL RESIDENTS OF THE 48 CONTIGUOUS UNITED STATES AND THE DISTRICT OF COLUMBIA, AGE 18 OR OLDER AT THE TIME OF ENTRY. ONE WINNER WILL BE CHOSEN ON 3/7/14 AND WILL RECEIVE $2,000 TO SHOP SPRING 2014 RUNWAY LOOKS FROM REBECCA TAYLOR. SWEEPSTAKES BEGINS AT 9:00AM EST ON 2/25/14 AND ENDS AT 11:59PM EST ON 3/6/14. VOID WHERE PROHIBITED. SPONSOR: REFINERY29, INC. 225 BROADWAY, 23RD FLOOR, NEW YORK, NY 10007, U.S.A. SEE FULL RULES HERE.